"One does well to put on gloves when reading the New Testament. The proximity of so much uncleanliness almost forces one to do this." "Read the Bible itself. Read the statements of preachers. And you will understand that God is the most desperate character, the worst villain in all of fiction." "I esteem the Gospels to be thoroughly genuine, for there shines from them the reflected splendor of a sublimity proceeding from the person of Jesus Christ of so Divine a kind as only the Divine could ever have manifested on earth." A total of thirty-nine books make up the Old Testament. In English translations, the Old Testament is categorized as follows: Genesis to Deuteronomy comprise the Torah, also called the Book of the Law, or Pentateuch; Joshua to Esther comprise the historical books; Job to Song of Songs are the books of poetry and ethics; and Isaiah to Malachi are the books of the prophets. Josephus, a first century Jewish historian, confirms that no Hebrew scriptures were added after the time of the Persian King Artaxerxes. Josephus states, "Because the exact succession of the prophets ceased... no one has dared to add anything to them, or to take anything from them, or to alter anything in them." 2 He then goes on to list those books which confirm the Old Testament of today. While the Old Testament was the main text used by the Jews who were looking for the coming Messiah (or Christ), the New Testament is a collection of writings by those who believed Jesus was that Messiah; the Messiah promised by O.T. prophecies. After his crucifixion, Jesus' apostles, his closest disciples, carried out Jesus' command to care for and expand the now combined group of Jewish and Gentile believers (Christians). This group Jesus collectively called his church. But the Christians, like the Jews, were decentralized after the fall of Jerusalem. the miracles God worked through them. The need to collect the apostles' letters grew as they died and the church expanded. There exists evidence in correspondence to the Corinthian church by Roman church leader Clement in the year AD 96 that he knew of the letter Paul had written to the Roman church, as well as of at least one letter to the Corinthians. 5 But Christian churches, not having shared a common geographic home but for a short time, had no single collection of all the apostles' writings. A formalized set was desired to provide the churches with the complete teachings that God had spoken through the apostles. A formal set of the inspired, apostolic writings would also serve to discourage any and all other writings from being introduced as equal in authority. Within the first century, the four Gospels came together as one group. The gathering together of Paul's letters and the others followed this. In AD 180, Irenaeus, bishop of Lyons, confirmed a collection of all but seven of today's twenty-seven letters. 6 The early church fathers Eusebius, Polycarp, Augustine, and Origen contributed to confirming the resulting canon of today's New Testament. These letters, though they had always been accepted as inspired, were declared official at the Synod of Hippo in AD 393. Revelation is the apocalyptic book. 5.4 Is the Bible open to future inclusions? Jesus repeatedly endorsed and often quoted from the Old Testament of his day without any indication that it was flawed or lacking. This is the same Old Testament we have today. The agreement of the early church to have received God's complete revelation is quite clear: no apostolic book remains to be produced (should someone desire to introduce a writing, old or new, by such a claim). With the passing of the Christ's apostles, the New Testament closed. Another indication of the completeness of the known canon, especially for the New Testament, is the sheer volume of early copies known to exist. If we only had three or four copies, for example, there might be some question as to whether or not our few collections lacked a major letter. Note that the world has 643 copies of Homer's Iliad. 8 Although none of the Iliad copies are closer to the original autographs than 500 years, some suggest that only that kind of volume can provide today's readers with a reliably complete and coherent translation. This is responded to by revealing that early copies of the New Testament and portions thereof number in excess of 24,000, not merely 600 plus; and the earliest copy perhaps only twenty-five years removed from its autograph, not a whopping 500 years. 9 Therefore, the possibility that a vital inclusion was commonly lost, missed, or destroyed among each of 24,000 manuscripts is virtually zero, far too small to threaten confidence in the completeness of the existing canon. 5.5 What about the existence of secret books? What about the existence of secret books or subsequent biblical texts as claimed by various persons and religions? Invariably, all such discoveries and secret revelations have thus far proven to be inconsistent with the confirmed Word of God. The Gospel of Thomas is an example of this. Such a document, produced 300 years after the final apostle died, cannot come along contradicting the uniform testimony of all previous sixty-six books of the Bible and claim to be number sixty-seven. You can be certain no such writing has been "wrongfully overlooked" for inclusion into the canon. Note that the prophets and apostles partly claimed authority for their oral and written teachings on miracles they were enabled to work or prophecies they were granted to give. Remember that it was their writings which were found to have been inspired by God that were collected together into the Bible, not just any pleasant thought or novel idea that some person had to offer. Clearly the Old Testament has remained intact and without extraneous inclusions since hundreds of years before Christ. The New Testament has remained complete itself for over 1,600 years. But just as the previous turn-of-the-century saw a rash of new religions sporting lost gospels and their own revelations, so might the next. That may or may not happen, but of one thing we can be sure: we today possess the complete and unaltered Word of God. 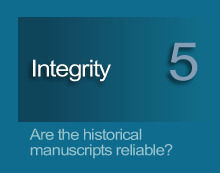 NEXT: How were the manuscripts passed down over the ages? What are the apocrypha and psuedepigrapha? The previous chapter provided a list of biblical books and the dates written. This section responds to the follow up questions, "Are there any more books? Can there be?" 5.4 Open to furure inclusions?